For the purposes of SEN law, a young person is any person over compulsory school age but below the age of 25. Compulsory school age ends on the last Friday in the June of the academic year in which a person turns 16. It is expected that many parents and guardians will still want to be actively involved in ensuring that a young person connected to them receives the correct educational provision. This is permitted, as long as the young person agrees to their involvement. In the cases of young people under the age of 18, the local authority will encourage the involvement of parents/guardians in all decision making processes. 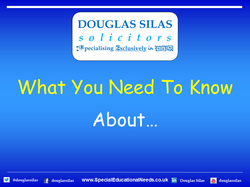 If a young person lacks capacity (as defined in the Mental Capacity Act 2005) then a representative, most often the parents of the young person, will take decisions on their behalf. Any representative making decisions on behalf of another must always act in the best interests of the young person, and ensure that the young person is allowed to make as many decisions for themselves as possible.